Grand plans to demolish Brighton’s art deco Astoria cinema and replace it with managed housing for young professionals have been turned down because the flats were too dim and noisy. Student housing developers Threesixty wants to build a six-storey block of flats which will act in a similar way to student schemes, with shared kitchens and living areas, but with luxury facilities such as a gym and cinema, and aimed at working people who can’t afford the city’s high rents for standard flats. 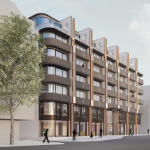 But Brighton and Hove City Council’s planning committee refused the plans yesterday because many of the 70 flats were substandard as they only had windows on one side of the building. However, Threesixty was invited to come back with new plans which addressed the committee’s concerns. Simon Bareham from Lewis Planning speaking for Threesixty told councillors: “This is not a standard student housing scheme, it is a specialist, high amenity development. It has support of the heritage team, English Heritage and meets 10% of the city’s housing need. The proposed scheme includes a gym, cinema room, dining room, kitchen, bookable guest room, 74 cycle storage spaces and a courtyard garden. However, councillors criticised the proposal because it did not include affordable housing, against council recommendation of 40% affordable housing – 28 units in this case. The developers said the accommodation is suitable for the private rented sector but does not lend itself to affordable housing. The planning officer recommended refusing the development because it offered substandard accommodation with insufficient access to natural light, an unduly enclosed outlook, potential noise from the inner courtyard and lack of privacy for residents. Several councillors, including Councillor Maggie Barradell, agreed that the development was confused, combining residential and commercial units with an inside garden courtyard, and questioned the design. Councillor Carol Theobald criticised the plan because there was no parking in it, saying the underground courtyard could have cars in it. 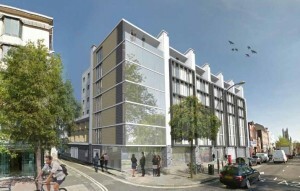 The committee voted by nine to two to refuse the application, in line with the planning officer’s recommendation. The grade II listed Astoria in Blenheim Place was a cinema from 1933 to 1977 and then a bingo hall until 1996/7. There is already listed building consent in place for its demolition, but this will not happen until an approved scheme is ready to commence. Separately, councillors also refused an application by Aldi on London Road to extend the opening hours of the store. These hours were specific conditions agreed when Aldi opened. I am glad to have voted against knocking down the Astoria (not that this carried). Imaginative use could have been made of the building if the place is as “creative” as it irks to style itself. All the proposals for the building – including the usual Mike Holland baloney – have since been mediocre. One might almost suspect that the Applications are made simply to landbank a building which will go up in value with the improvement to Valley Gardens (if Labour does not drag its heels on this scheme for which Government money has been awarded).